South Korea is suffering some embarrassment after repeatedly failing to put a satellite into orbit with homegrown rocket technology while North Korea succeeded. Some are detecting echoes of the Sputnik crisis in 1957, when the U.S. found itself bested by the Soviet Union's launch of the world's first satellite. Seoul now lags behind Pyongyang in terms of rocket technology by at least six years, experts estimate. The South plans to test-fire a rocket with 75 tons of thrust in 2018. "There's no difference between rockets and missiles in the first- and second-stage performance to be able to fire warheads or satellites," said Prof. Yoon Ung-seop at Yonsei University. "The North has proved its ability." A modified version of the rocket launched in 2009, the latest one is a three-stage liquid-fuel rocket with improved engines and weighs 92 tons, 10 g heavier than its predecessor. The South's Naro rocket is stronger than the North's as it weighs 140 tons and has 170 tons of thrust, but the first-stage booster, largely responsible for the thrust, is made in Russia, so the Naro cannot be said to be wholly homegrown. 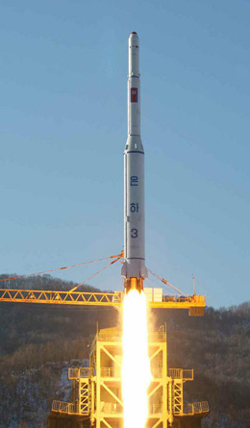 Seoul's two attempts to launch it in 2009 and 2010 flopped, and the third attempt this year has been postponed as a problem was found in the South Korean-built second-stage rocket. A string of mishaps have all been due to glitches in electrical parts that are taken care of by the South Korean side, said Prof. Chang Young-keun at Korea Aerospace University. "The North far exceeds us in rocket technology," he added. If the North really did manage to put a satellite into orbit, it is only the 10th member of the global "space club." Seoul originally aimed to join the elite group of countries in 2005, but that was thwarted when Russia declined to transfer its technology for the first-stage rocket. Then, in 2008, South Korea was outpaced by Iran's launch of the Safir rocket.